Mineral Blush by Blue Water Naturals! The mineral-based formula of Blue Water Naturals Mineral Blush is famous for its oil-absorbing properties, ease of application and excellent coverage. As more people strive to live healthier lifestyles, mineral-based makeup has become more popular because it has a lightweight texture and makes your skin look radiant and luminous. 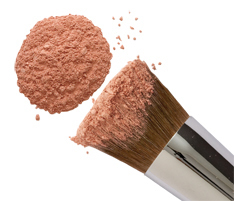 With intense color, Mineral Blush looks natural while adding a long-lasting, fade-resistant, natural blush.